Which petals would you like? This complete package includes 10 personalised confetti pops filled with your choice of natural petal confetti. 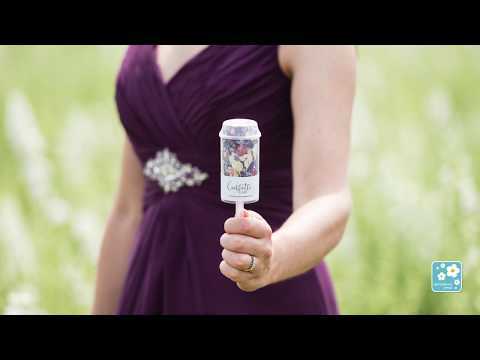 These custom pops are completely bespoke for you and made to order so you can match them to your wedding colours and theme. Wow your guests with your unique pops, they may even keep them as mementos. Take a look at all the Personalised Confetti Pop designs here. First choose your confetti colours, followed by the pop design and your background colour, then fill in your names and wedding date. Just make sure to click update preview to see what your cones will look like. After you've finished with your pops they can also be recycled too. Alternatively you can return your empties using our free returns labels included in your order so we can recycle them for you, or reuse if possible. Click here to read about how we're trying to be more sustainable.